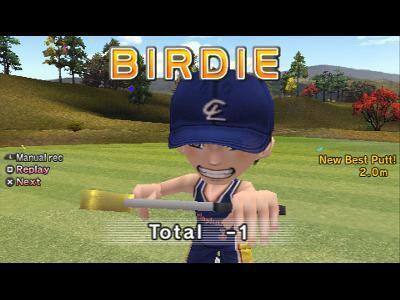 Despite its look, Everybody’s Golf is going to freak out players who look at the cartoony appearance of the title and make their assumptions on the game based on that fact alone. EG has a serious little game engine in it that is going to please both real gamers and those who only play the game on a screen. The title allows a normal game of golf that rewards the gamer by allowing little treats for you if you win a game. New outfits and also the ability to upgrade your game are there, these are presented in a fashion that make you keen to succeed when playing the title. The way that the game is fairly easy to pick up and play is also a great reason that purchasers of the title are going to get a ton of value for money. The controls on the PSP are totally suited to this game with the learning factor being only a few minutes before you are going to be adept at the game and having a lot of fun. Don’t be put off if you don’t like real life golf, the characters that inhabit this world certainly make it all interesting and will keep you playing the game for much longer than you would think possible. Graphically the title is going to annoy purists with the exaggerated style of the characters on the game but all I can say is get over it, and fast! 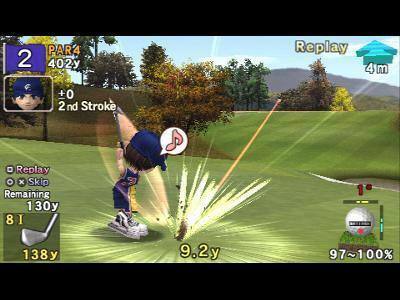 There is a strong game engine, combined with a good golf physics model that is sure to keep everyone happy. There is support for 8 player multiplayer, however there is no internet support for this title which would have been a lot of fun. Audio is something you’ll love or hate, I doubt there will be much in between. It’s a bit hokey and repetitive but suits the game so perfectly that you can’t help but forgive it. Everybody’s Golf is sure to keep you interested in the game long after you get sick of the more “serious” titles, it’s the game that just keeps on giving with little rewards and unlockable delights for the player who sticks it out for the long haul. The style of play is addictive and so far I’ve not minded playing the same courses over again, its just good old-fashioned fun! Swing into Everybody’s Golf! You’ll love it! Highly Recommended.